There was a point in time when I was completely obsessed with gluten free baking. I’m not sure how it all started really, but I was inspired to do so and spent a small fortune acquiring every gluten free flour known to the universe. My cabinets were stuffed to the brim with brown rice flour, white rice flour, millet flour, almond meal and almond flour- I could build a small sand castle out of this stuff. Speaking of sand, initially, everything I baked tasted weird and gritty. The culprit, as I quickly learned was the rice flour. For best results, you’re supposed to blend GF flours for best texture, say rice flour with oat flour or something like that. But honestly, I was just so confused and put off by my failures that I gave up and inevitably went on a gluten binge. And then, Alanna wrote a cookbook. Alanna is the uber talented voice and photographer behind The Bojon Gourmet. Her work is so inspiring (and delicious!) she could make a pile of dirt look like an edible sunset. Seriously, hop over to her blog and see for yourself. PS- I had the opportunity to spend time with her recently and I felt like I was in the company of the elusive lioness… beautiful and unique. 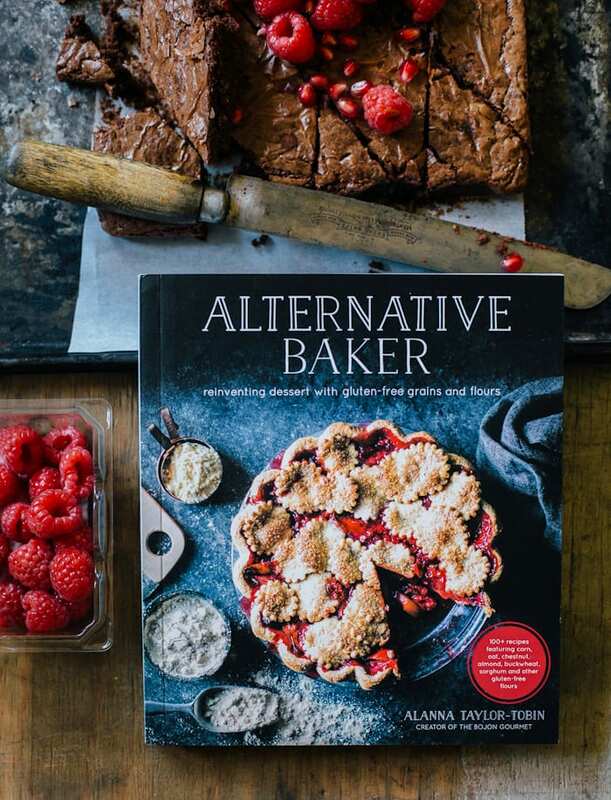 Her new book, aptly titled ‘Alternative Baker’ showcases over 100 recipes with gluten free grains and flours. But get this- no rice flours! Sand haters rejoice! I always knew there was more to GF baking than rice flour, but wasn’t quite sure how to get there. Alanna takes the time to show you, as the pages are expertly written and photographed. There’s even a short section on recipe recommendations if you’re a newbie to GF baking- love that. The only dilemma I encountered, was what recipe to make first. Good grief, I took that book to bed several times and would literally drool over what to make. We all love brownies in our house, and I knew her squidgy chesnut version was a good place to begin. The recipe starts out by melting good quality chocolate and butter together. When you combine this mixture with the rest of the ingredients (while still warm), you’ll get those crackly crinkled brownie tops, according to Alanna. So clever. And here’s something I found really interesting: there’s no leavining agent in this recipe. Right, so no baking powder or baking soda. The trick is to whip the sugar and eggs until light and fluffy to naturally give the brownies a small boost. It’s actually fun to watch the mixture morph from orange and sludgy to pale, creamy yellow- that’s how you know it’s done. Then, pop the whole thing in the oven and find something to do for the next 25 minutes. I’d suggest licking the bowl. To finish, I scattered fresh raspberries and pomegranate over the top, because berries and chocolate happen to be my personal fave. But trust me when I tell you, these beauties are totally fine without it. Perfectly sweetened with light notes of nuttiness from the chestnut flour, these brownies score some serious points. My boys LOVED them. We fought over the corner pieces. The boys also loved her GF scones by the way, which I’ve made for them previously and they were devoured with gusto (they soften like cake on day two!). If you’re looking for a wonderfully inspiring book on GF baking, or perhaps know someone who would be over the moon with their very own copy…. guess what?! I’m giving away Alanna’s gorgeous book! Just leave a comment below and tell me about your experience with GF baking. I’ll pick one lucky winner! Contest is open to US residents only- thank you & good luck! Adjust your wire racks to fit the center of the oven and preheat to 350 F (175 C). 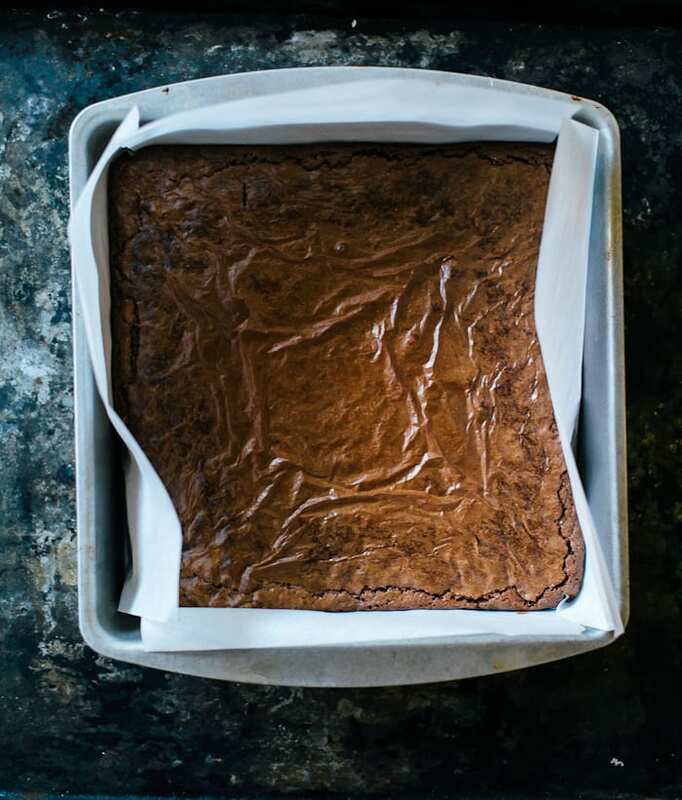 Line an 8-inch (20 cm) square pan with parchment paper for easy removal. In a small saucepan, melt the butter and chocolate together over very low heat. Stir often to prevent burning. Once melted, remove from the heat and keep warm. Sift the chestnut and tapicoa flour into a small bowl. You might be tempted to skip this step but chestnut flour can get clumpy! It takes 2 seconds. In the bowl of a stand mixer, add the eggs, sugar and salt. Whip on medium-high speed, with the paddle attachment, until light and fluffy, about 5 minutes. You'll know it's ready when the mixture turns pale yellow in color. Reduce the speed to low, and add the vanilla and warm chocolate. Add the flours and mix briefly to combine. Remove the bowl from the base and give it one final stir with a rubber spatula, making sure none of the flour has settled at the bottom. Bake for about 24-30 minutes or until a tooth pick comes out with moist crumbs attached. Cool completely before cutting into squares (dip your knife in hot water in between slices for clean cuts). 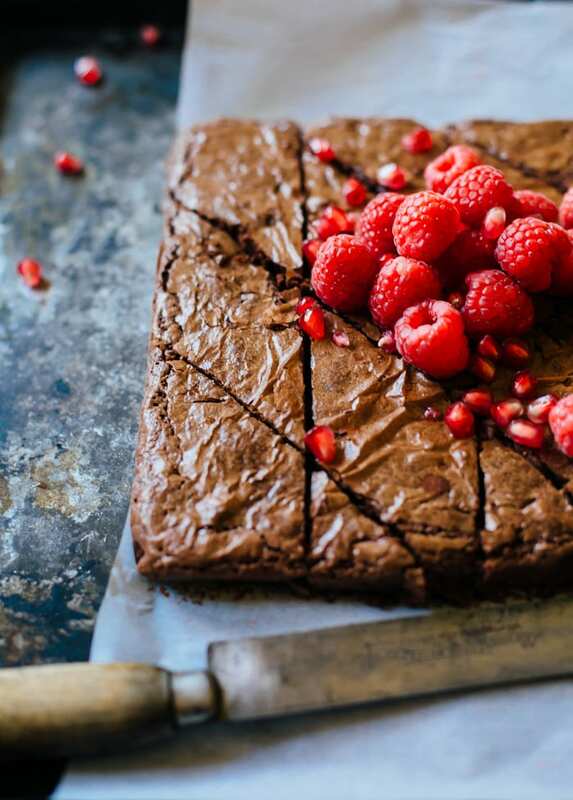 Top with raspberries and pomegranate seeds before serving. Previous Post: « a farm tour + butternut squash risotto. To find a GF recipe that tastes THIS good…is awesome! I can stop looking and use this recipe exclusively! Thank You. Thank You. Thank You! Ohhhh look at those brownies!!! I, too, love Alana’s book. What a talented lady, no? I have never baked with chestnut flour before, but looking at these I feel like I need to go out and buy some. Hope all is well Emily. I literally cook by the book. The Alternative Baker Cookbook looks like a dream come true. I have a gluten-free grandson with Celiac disease. Cooking gluten-free for him has been a frustration for me because of my inexperience doing so. I have limited myself to ideas such as baking cheesecakes using pre-made gluten free shortbread cookies for the crust. Alanna Taylor-Tobin is a blessing in disguise. Thank you for introducing us. The combining of the flours makes perfect sense! Every time I look at the ingredient list of delicious GF baked goods that is what I see but it always seems to overwhelming to try at home. The GF baked goods that I have tried are usually not eaten and tossed out which is such a waste when I consider the cost of the ingredients. This looks doable! Thank you! so, yes, I would be very interested in this beautiful cookbook! I was an avid baker (won prizes for my pies, cakes, cookies, etc.) until I went gluten free for a skin disease I have that became immediately better when I stopped eating wheat. Have I tried baking gluten free–not too much. I am also cutting back on white sugar, etc., so it is really hard. Do I have a pantry and freezer full of different types of flour. Yes! Are they being used? Pretty much the answer is no. I am going to check out this cookbook and see what I can produce as far as baked goods from it. Thank you for this post telling us about it. Book and recipe looks great. I have actually been looking to use some chestnut flour I have in the freezer. I love to bake, but haven’t had the best luck with GF baking. It’s the texture –somehow not as nice as regular baking, and I am reluctant to use the gums, etc. I’d love this book. Sometimes I get skin irritations I know come from inflammation. Experience it has gluten free? Frustrated. So many ingredients, but too many failures.looking forward to checking this out. I’m always on the lookout for good gluten free recipes! I have a dear friend who is gluten free and our families have dinners together regularly. I have t baked much gluten free. I’ve bought some of the alternative flours lie chickpea flour, almond flour and more. What little I’ve tried hasn’t been that great. I’ve seen Celia make chestnut flour brownies too and now these, I’m intrigued. I love GF Brownies made with nut flours. Can’t wait to try this recipe too! The cookbook looks wonderful too! This looks amazing, something I’m going to try. There was a time I was obsessed with gluten free baking, and just like you I got every kind of gluten free flour and tried to experiment, but most of the time things turned out tasting “chalky”… I will definitely look into this book, looks amazing! Can’t wait to try this recipe. I’ve always wondered how chestnut flour tastes. Add chocolate and wow! I would put this cookbook to good use baking for my daughter who can’t have wheat. i don’t like rice flour and haven’t seen many recipes that don’t use it so my GF experience is limited. 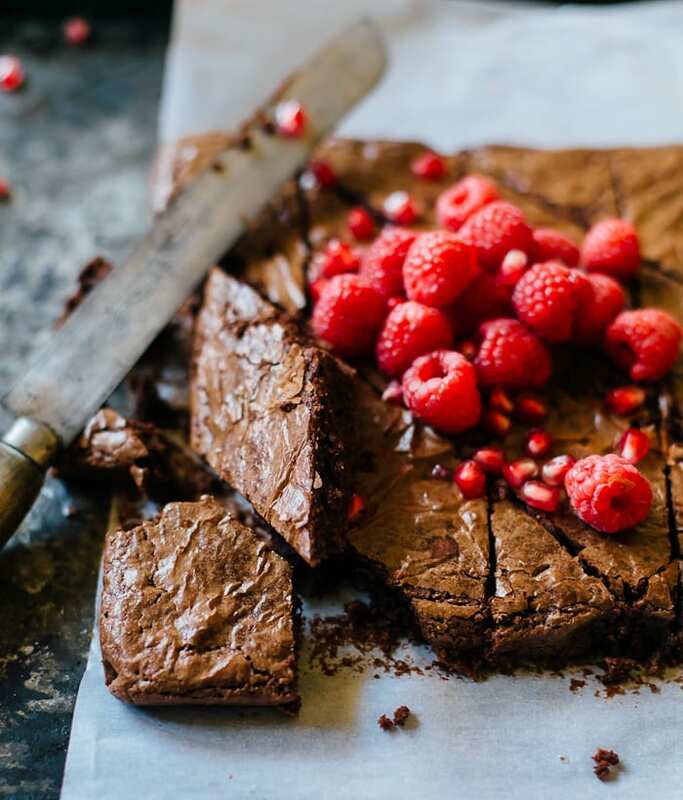 I love to bake but I’m finding gluten free baking a little challenging… Can’t wait to try these brownies, they look amazing! I love replacing white flour with nut flours to make food more interesting and nutrient-dense, but it’s tricky to get the texture just right. Can’t wait to try this recipe for my Alzheimer’s prevention cooking classes–it will be a great way to help my students eat more nuts! I love baking with a variety of whole grain flours. My husband recently found out he has a gluten intolerance, and while I’m sad to give up some of my favorite flours, I’m excited to learn to bake with gluten free alternatives. I’ve been eyeing Alanna’s book as a good place to start, especially because I’d like to avoid using a lot of rice flour due to the arsenic levels. These are beautiful! I love Alanna’s site too… her photos are definitely drool-worthy (as are yours!). I’m in Canada so can’t enter, but I couldn’t resist commenting anyway. I wish I could have one of these right now instead of being stuck here at my desk at work haha. These look amazing! I would love to try out chestnut flour! I enjoy to bake yet I’m finding gluten complimentary baking a little challenging … Can’t wait to try this recipe. I have actually always wondered exactly how chestnut flour preferences. Add chocolate as well as wow! Have done lots of great gluten free baking, but still on a search for an awesome gluten free challah bread. I worked for about 18 months before giving up. Got shape, texture, height, but although tasty, none of it tastes like challah should. Wheat must have an incredibly fine-tuned taste. Maybe the chestnut flour will do it?